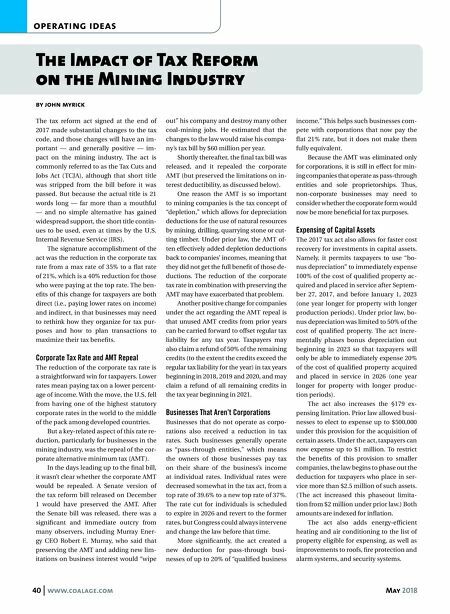 40 www.coalage.com May 2018 operating ideas The Impact of Tax Reform on the Mining Industry by john myrick The tax reform act signed at the end of 2017 made substantial changes to the tax code, and those changes will have an im- portant — and generally positive — im- pact on the mining industry. The act is commonly referred to as the Tax Cuts and Jobs Act (TCJA), although that short title was stripped from the bill before it was passed. But because the actual title is 21 words long — far more than a mouthful — and no simple alternative has gained widespread support, the short title contin- ues to be used, even at times by the U.S. Internal Revenue Service (IRS). The signature accomplishment of the act was the reduction in the corporate tax rate from a max rate of 35% to a flat rate of 21%, which is a 40% reduction for those who were paying at the top rate. The ben- efits of this change for taxpayers are both direct (i.e., paying lower rates on income) and indirect, in that businesses may need to rethink how they organize for tax pur- poses and how to plan transactions to maximize their tax benefits. Corporate Tax Rate and AMT Repeal The reduction of the corporate tax rate is a straightforward win for taxpayers. Lower rates mean paying tax on a lower percent- age of income. With the move, the U.S. fell from having one of the highest statutory corporate rates in the world to the middle of the pack among developed countries. But a key-related aspect of this rate re- duction, particularly for businesses in the mining industry, was the repeal of the cor- porate alternative minimum tax (AMT). In the days leading up to the final bill, it wasn't clear whether the corporate AMT would be repealed. A Senate version of the tax reform bill released on December 1 would have preserved the AMT. After the Senate bill was released, there was a significant and immediate outcry from many observers, including Murray Ener- gy CEO Robert E. Murray, who said that preserving the AMT and adding new lim- itations on business interest would "wipe out" his company and destroy many other coal-mining jobs. He estimated that the changes to the law would raise his compa- ny's tax bill by $60 million per year. Shortly thereafter, the final tax bill was released, and it repealed the corporate AMT (but preserved the limitations on in- terest deductibility, as discussed below). One reason the AMT is so important to mining companies is the tax concept of "depletion," which allows for depreciation deductions for the use of natural resources by mining, drilling, quarrying stone or cut- ting timber. Under prior law, the AMT of- ten effectively added depletion deductions back to companies' incomes, meaning that they did not get the full benefit of those de- ductions. The reduction of the corporate tax rate in combination with preserving the AMT may have exacerbated that problem. Another positive change for companies under the act regarding the AMT repeal is that unused AMT credits from prior years can be carried forward to offset regular tax liability for any tax year. Taxpayers may also claim a refund of 50% of the remaining credits (to the extent the credits exceed the regular tax liability for the year) in tax years beginning in 2018, 2019 and 2020, and may claim a refund of all remaining credits in the tax year beginning in 2021. Businesses That Aren't Corporations Businesses that do not operate as corpo- rations also received a reduction in tax rates. Such businesses generally operate as "pass-through entities," which means the owners of those businesses pay tax on their share of the business's income at individual rates. Individual rates were decreased somewhat in the tax act, from a top rate of 39.6% to a new top rate of 37%. The rate cut for individuals is scheduled to expire in 2026 and revert to the former rates, but Congress could always intervene and change the law before that time. More significantly, the act created a new deduction for pass-through busi- nesses of up to 20% of "qualified business income." This helps such businesses com- pete with corporations that now pay the flat 21% rate, but it does not make them fully equivalent. Because the AMT was eliminated only for corporations, it is still in effect for min- ing companies that operate as pass-through entities and sole proprietorships. Thus, non-corporate businesses may need to consider whether the corporate form would now be more beneficial for tax purposes. Expensing of Capital Assets The 2017 tax act also allows for faster cost recovery for investments in capital assets. Namely, it permits taxpayers to use "bo- nus depreciation" to immediately expense 100% of the cost of qualified property ac- quired and placed in service after Septem- ber 27, 2017, and before January 1, 2023 (one year longer for property with longer production periods). Under prior law, bo- nus depreciation was limited to 50% of the cost of qualified property. 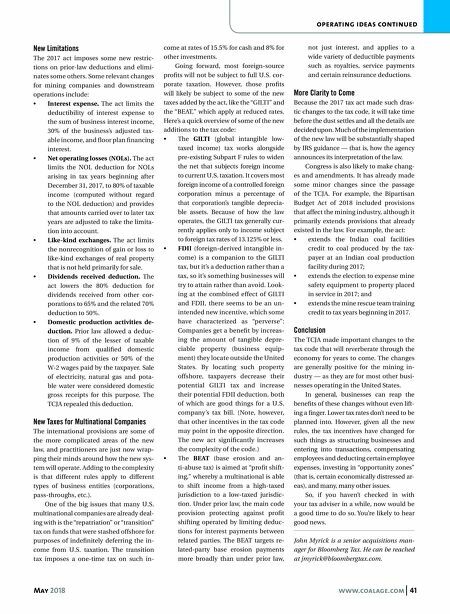 The act incre- mentally phases bonus depreciation out beginning in 2023 so that taxpayers will only be able to immediately expense 20% of the cost of qualified property acquired and placed in service in 2026 (one year longer for property with longer produc- tion periods). The act also increases the §179 ex- pensing limitation. Prior law allowed busi- nesses to elect to expense up to $500,000 under this provision for the acquisition of certain assets. Under the act, taxpayers can now expense up to $1 million. To restrict the benefits of this provision to smaller companies, the law begins to phase out the deduction for taxpayers who place in ser- vice more than $2.5 million of such assets. (The act increased this phaseout limita- tion from $2 million under prior law.) Both amounts are indexed for inflation. The act also adds energy-efficient heating and air conditioning to the list of property eligible for expensing, as well as improvements to roofs, fire protection and alarm systems, and security systems.